Today, I’ve wasted some time drawing a new logo for planet.igalia.com. Yeah, at Igalia, we have installed a new site to sindicate all the blogs in which our developers are writing. Because of our name, we have been ever related to the Asterix & Obelix iconography, and, because of our place in the world, Galicia, we have deep roots in Celtic culture. That’s why I’ve drawn a “palloza”, this typical house made of stone and straw. I’ve also drawn a second version with 4 satellites surrounding our loved Igalia planet. It was inspired by alex and tries to represent the four roman campments which sourrands Asterix’ town. I’ve to say that the four different colours were taken from the MS Windows flag ;-). You could take a look at it in my Flickr page, if you want. 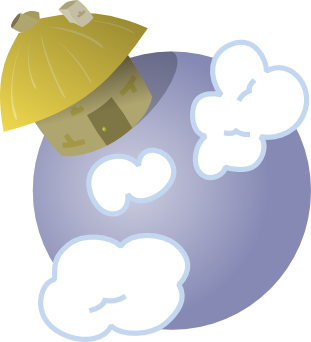 Finally, I’ve also created a favicon for planet.igalia.com with this picture and uploaded to our site. I’ve no asked to anybody for their agreement because I know we would start a new design tastes war as we were used to have, so, critics are welcome but not heared :-D.
Last monday I had an english exam at the Official Languages School in A Coruña. I’m studying the 5th and final level so I’m supposed to have a quite good english level (which is not true as you could guess from these posts ;-)) and the exam should have been a bit difficult. As far as I’m not studying english, I mean, I’m just going to the classes, I decided to stay at home the whole weekend trying to train the related grammar and memorize vocabulary. The nightmare became true!! The point is that, the harder I tried to study, the easier I did other tasks instead. I don’t know if you have ever been in this situation but for me, it’s becoming a bad habit. Actually, it was a torture to put my eyes on the english book, I had to do another thing!!! And I did it. I did clear up my room (yeah! !, stop laughing!! ), I was ironing, doing the washing up, went to play a soccer match, etc. 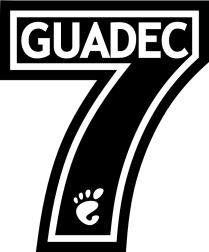 I was even drawing a logo prototype for the GUADEC 2006 logo contest, which I know the deadline had just gone, and the thematic I choose was doing a soccer player t-shirt simil using the number from the GUADEC version (7), even knowing the contest was for a general GUADEC logo, not just for the GUADEC#7 event!!!!! Crazy, isn’t it!!!! I didn’t want to study at all, but I had to. Anyway, I accomplished my subconscience target, I was abled to make only one reading of the whole subject. If you are curious enough, you can take a look to my two logo prototypes which survived to the creation process at my Flickr page. And, what about the exam? Well, IMHO it was quite easy and, after 3h 30′ writing, I’m quite sure I’m going to pass it. Hey, I forgot it! I could have saved some extra points thanks to these hours “reading” grammar and vocabulary, so I have to say it wasn’t a waste of time.